Steve and Katie are very dear friends of mine who got married this past weekend at El Dorado Royale Resort in Riviera Maya, Mexico. Their wedding was the peak of a week of fun with friends and family. What a great place for a wedding! Such a beautiful location, and the guests were very well cared for. Everyone had a blast! Here are a "few" of my favorites from their beautiful wedding day! 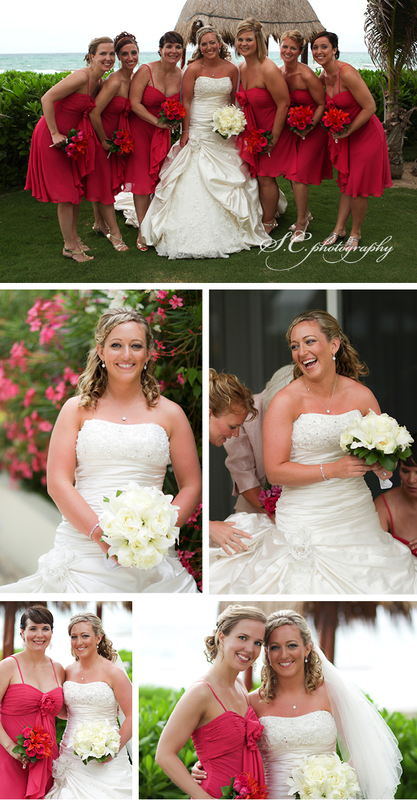 She had a gorgeous drop-waist ball gown! Of course Steve got a black eye the day before the wedding in a raucous round of pool volleyball. They had a burro surprise at their cocktail hour on the beach! Katie was a good sport and climbed on. Then the guests enjoyed burro-delivered cervezas. Thank you so very, very much Steve and Katie for including me in your destination wedding! I'm very touched that you chose me to capture such a fun week with your loved ones. We had such a great time and will remember it forever.